There’s a revolution brewing in the numismatics markets that is being fed by its own successes causing its own failures. The first salvo was fired by the Professional Numismatic Guild and Industry Council for Tangible Assets in 2006 when they jointly performed their own survey. One of the results was that PNG and ICTA were sued by a few of the services whose services were deemed unacceptable. Following the report, the services not named Numismatic Guarantee Corporation and Professional Coin Grading Service went into turmoil. PCI went out of business around the time the J.T. Stanton left the company. James Taylor bought ANACS from Anderson Press and move the company to Englewood, Colorado. Taylor raided graders from Independent Coin Grading Company. As a result, ICG moved to Tampa, Florida. In the meantime, most of those companies rated “Unacceptable” in the PNG-ICTA report either went out of business or have been marginalized to the point of irrelevance. Next was the creation of the Certified Acceptance Corporation as a grader of the graders. As I have explained in the past, although a fourth-party or validation service might be helpful, the CAC is not an independent organization providing the service. The company trades on its inside information in what it calls “market-making.” This type of arbitrage activity would be illegal in the securities industry but has given a false sense of security in the numismatics world. Now there are rumblings again and this time there are a few significant people doing the talking. For the last six month, noted numismatist and author Q. David Bowers has written several stories for Coin World that has been both critical of the coin grading business and the complexity of the grading system. Although Bowers recognizes that there are advantages to third-party grading there has been changes and not for the better. In other words, third-party grading and authentication is good for the hobby but the services have problems. Could you tell the difference if they were not in the holders? Following NGC’s change in its registry rules to no longer allow coins graded by PCGS in their sponsored registry sets, NGC Chairman Mark Salzberg publishes an analysis on what he claims is the decline in PCGS-graded coins. In his analysis, Salzberg looks at the prices realized from auction sales of certain PCGS coins over time and compares them to PCGS population reports for those coins. Through a set of charts that resemble the supply-and-demand curves, it is unsure if the charts prove anything. 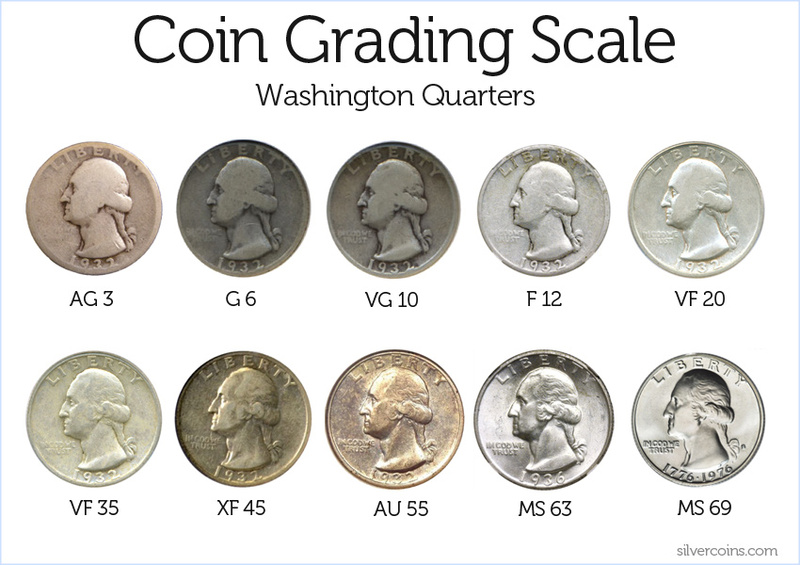 If Salzberg is trying to say that PCGS is practicing grade inflation, known as gradeflation, then he could prove that with the changes in the grading for many modern coins. However, comparing the population report (supply) of a classic coin like the 1912-S Liberty Nickel, may not be valid without looking at other factors, such as the population report of lower grades declining. Also, Salzberg only uses the prices realize from auctions held by Heritage Auctions and not a survey of the industry as a whole. Does PCGS practice gradeflation? Can we also ask does NGC practice gradeflation? And we do not know how these services fare with CAC who keeps its raw data hidden from the public while using it to increase the value of the coins it examines. Dave Bowers provides good insight into the problems with coin grading without trying to overburden the reader with statistics even with the suggestion that dealers may overly emphasize grade differences and not the aesthetics of the coin. The numismatics industry has put too much trust in these grading services without oversight. When oversight was tried by industry representative organizations, the companies that did not like the results litigated rather than fix their problems causing the attempt at oversight to be eliminated. Then a validation service appears to only turn out to be something they are using to manipulate the markets in their favor. Is this coin worth less because it is is in an ICG holder? In numismatics as in politics, I agree with Thomas Jefferson when he said, “I hold it that a little rebellion now and then is a good thing, and as necessary in the political world as storms in the physical.” Maybe it is time to stand up and ask PCGS why their population reports are going up in higher grades? We should ask why NGC is concentrating more on gimmick holders than the coin in those holders? And are NGC’s population reports without reproach? I am sure we can find problems with their population reporting. What happened to ANACS? Did Taylor get too cozy with the television shopping networks to justify general feeling that their coins are better priced as raw? And what the heck happened to ICG? Rather than implicitly trusting these companies, collectors and investors may want to start questioning all of these companies about their practices. Otherwise, you may find that coin you paid MS-70 prices for is really not worth more than an MS-68, which was a better looking, to begin with! Read their 2006 press release below or on Scribd. Is a new grading system needed? Over the last few years there have been many numismatic writers who have taken to their keyboards to complain about the state of coins grading. Aside from your intrepid blogger there was a series of articles that appeared in Coin World by Q. David Bowers. In his articles, Bowers notes that even though the American Numismatic Association grading standards have not changed in quite some time, coins in older holders usually are graded higher today than they were when originally graded. One area where this is hurting the hobby is when trying to buy coins using online auctions. In a less than scientific study, I have noticed that while looking for a specific coin that coin once graded by the Professional Coin Grading Service in their old green holders (OGH) tend to sell at a price half-way to what it would be if it was the next grade higher. Coins in older Numismatic Guarantee Corporation holders sell close to a similar price. It is not known how many coins are cracked out of their holders and submitted to the grading services are submitted as raw coins. Most of these “crack out artists” do not turn in the labels for the grading services to adjust their population reports. Some coins could be counted several times by all of the major grading services while collectors fish for better grades. Part of the problem is with the concept called market grading. Rather than looking at the coin and determine the technical state of preservation, the grading services take that grade and try to rank it within the market of similar coins. In the mean time, they participate in forums that teach technical grading without explaining market grading. Could there be a better way? 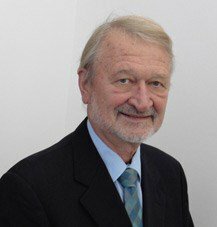 On the CDN Publishing Blog is a post by Rick Snow suggesting a different type of grading system based on a 15-point technical scale. Coins would be graded on a 0-5 scale for the condition of the planchet, state of the die as struck, and the strike. In this notation there would be no “Full Bands,” “Full Head,” or similar designations. Those coins would receive a strike score of 5. If that Jefferson nickel does not show all six steps, then the strike would be a 4. A final column would be a color designator with either a percentage of color loss from the original strike or RD (red), RB (red-brown), or BN (brown) for copper coins. “Adjectival grade” (“Qualifier”: “Factor for Planchet”, “Factor for Die”, “Factor for Strike”, “Color Designation”). The “Qualifier” would be the sum of the factors for the planchet, die, and strike. It is an interesting idea especially for the current bullion coins. Honestly, can anyone really tell the difference between an American Silver Eagle graded MS69 versus one graded MS70? Yet, just because a grading service can allegedly tell the difference, there could be a two-to-three times difference in the price. However, I wonder if those coins were cracked out of their holders and resubmitted would they maintain their grades? Although the grading services claim that they are doing what is best for the hobby, they are for-profit corporations that has to satisfy a market that seems to be more interested in the plastic and the label than the coin it holds. Even these verification services are for-profit corporations that has owners and investors to answer to. One is even into “market making” by doing arbitrage-like trading of its own stickered coins. This type of market making questions their independence because it appears that they are using their influence to drive up the price of those coins. Would this type of grading be better for the hobby by providing the collector with more information? Is there an alternative that would fix the current system? Or is the current system just fine? Read the article on the CDN Publishing Blog and leave comments there and/or here! Artist’s conception of a 1964-D Peace dollar. Catching up with the numismatic news from the last few weeks, I saw a note that Professional Coin Grading Service is offering a bounty of $10,000 each to view and grade five of the very rarest coins. PCGS will grade the coins and return them to their owner along with the $10,000 reward. It started with the 1964-D Peace Dollar, a coin that was struck but never put into circulation and allegedly destroyed. PCGS, along with many others, believes that not every 1964-D Peace dollar was destroyed. The reward was offered in hopes that it would give someone the incentive to bring the coin out of hiding. However, given the current status of the 1933 Saint-Gaudens Double Eagles and the recent confiscation of the 1974-D Aluminum Lincoln cent, $10,000 is not a big enough incentive to risk losing this coin. 1873-S Seated Dollar: It was reported that 700 were minted but none have ever been seen. Some think these coins were melted as a result of the Mint Act of February 12, 1873 which ended the series in favor of the Trade Dollar. 1894-S Barber Dime: The U.S. Mint reported that only 24 were struck by only 13 have been discovered. One was found in circulation. This leaves 11 chances to claim a reward, if they still exist. 1841-O $5 Half Eagle: This was one of those coins where the U.S. Mint reported one thing and did another—or they were partying too much in New Orleans. Although they reported striking 8,350 of these coins in 1841, research shows that 8,300 of the coins were dated 1840. Could the other 50 be out there somewhere? 1849 Templeton Reid $25: Only one was ever known and was once part of the U.S. Mint Cabinet Collection. It was stolen in August 1858. Was it melted, as experts believe, or hiding in some unknown treasure trove? I wonder if there are any other coins that could be added to this list? Comment below if you have a thought. Seated Dollar and Half Eagle images courtesy of Heritage Auctions. Barber dime and Templeton Reid images courtesy of PCGS. If you are uncomfortable trying to detect whether a coin is counterfeit or not, you might first consider buying from a reputable dealer who has return and/or buy back policies. If you buy raw coins and have questions, ask that the coin be examined by a third-party grading service such as Numismatic Guarantee Corporation, Professional Coin Grading Service, ANACSand Independent Coin Graders. These third-party grading services have a buy-back guarantee so that if the coin is ever found to be counterfeit after it was certified they will buy the coin from you at the price you paid. You may be asked to pay the grading fees. Some dealers may charge a service fee for submitting coins to the grading services on your behalf. If you own coins that you may have questions about, either bring it to a dealer for an opinion or submit the coin to the third-party grading service yourself. NGC and PCGS have membership services that allow you to directly submit coins for authentication and grading. Members of the American Numismatic Association can register to directly submit coins to NGC. ANACS and ICG allows for collectors to directly submit coins for authentication and grading. For collectible currency, buy from a reputable dealer who has return and/or buy back policies. If you buy ungraded currency and have questions, ask that the note be examined by a third-party grading service such as Paper Money Guarantee or PCGS Currency. These third-party grading services have a buy-back guarantee so that if the note is ever found to be counterfeit after it was certified, they will buy it from you at the price you paid. You may be asked to pay the grading fees. Some dealers may charge a service fee for submitting coins to the grading services on your behalf. If you are buying through an online auction and you have any question about the coin, you are better off not trying to purchase it than trying to deal with returns. While there are quite a few reputable dealers who sell on these sites, it may take more than a month for the process from purchase to refund to occur. During that time, you will not have access to this money. Remember, caveat emptor, “let the buyer beware.” Without a warranty or some type of assurance, such as a graded and encapsulated coin, the buyer takes all of the risk. For sellers, caveat venditor, “let the seller beware.” Unless you expressly disclaim any responsibility, you will be held liable if the item is not true to its specification. You may also lose a future customer if that person feels cheated. Over the last number of years, we have seen when a hobby becomes popular and items increase in value, there are opportunists who will try to do whatever it takes to make money from the gullible and uneducated. This chapter was written to inform and educate you as to what to expect from those looking at your wallet and not to you as a valued customer so that you are not a victim. When I discuss these issues I am eventually asked, “Aren’t we protected by the Hobby Protection Act?” In short, the answer is yes and no. The Hobby Protection Act of 1973 and was amended in 1988 represents an attempt at stopping counterfeits in all collectibles based on the way the world worked in 1973 and slightly updated in 1988. A lot has changed since then including the technologies available to counterfeiters. The Hobby Protection Act requires that coins not made by the U.S. Mint include the word “COPY” somewhere on the surface. The law allowed law enforcement and buyers to go after the suppliers. The problem was that the suppliers were mainly in China and out of the reach of the U.S. criminal justice system. That changed in December 2014 when congress passed and the president signed the Collectible Coin Protection Act (Public Law No. 113-288). Under the new law, consumers and law enforcement can take civil action against the distributors and resellers of counterfeit coins. The Federal Trade Commission has published draft rules to update the wa they enforce the (16 CFR Part 304) made by the passage of the Collectible Coin Protection Act. FTC is required to publish the new rule in the Federal Register (81 FR 23219) and ask for public input on the new rules. These rules are the result of corrections made after a previous draft asked for comments on the costs, benefits, and overall impact of the rules. The Federal Register entry with the published proposed rule from the FTC is available from http://1.usa.gov/1ru569X. A PDF copy of the Collectible Coin Protection Act can be downloaded from http://1.usa.gov/1NUoHdd. Comments can be made on the FTC’s website or via postal mail as outlined on the website and in the Federal register. Even though the law has changed, you should educate yourself and work with reputable people to build your collection. Education can be fun and the knowledge will help you better enjoy the hobby! Certified coins images courtesy of Dakota Coin. Image of the PMG holder courtesy of Paper Money Guarantee. Image of the PCGS Currency holder courtesy of PCGS Currency. POLL: Do you collect grading service labels? In December, I coined a term “numismentos,” a portmanteau of numismatic + memento. I was reminded of that with the recent announcements from both major third-party grading services. Professional Coin Grading Service announced that as part of their 30th Anniversary celebration that they created a series of labels for their slabs including a retro-green label similar to the first labels issued by PCGS 30 years ago. Some, like the Mark Twain “First Strike” label will only be available at shows like the recently held the Long Beach Expo. 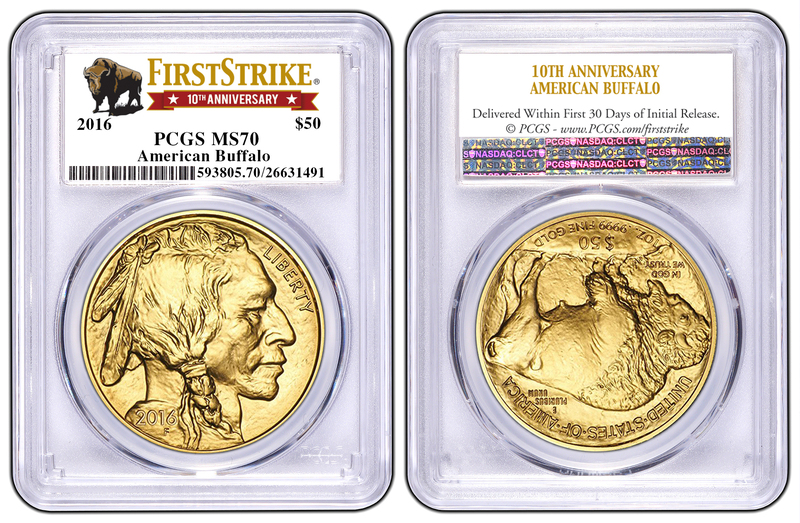 An example of a PCGS special First Strike insert label for the 2016 10th anniversary of the gold Buffalo coins. 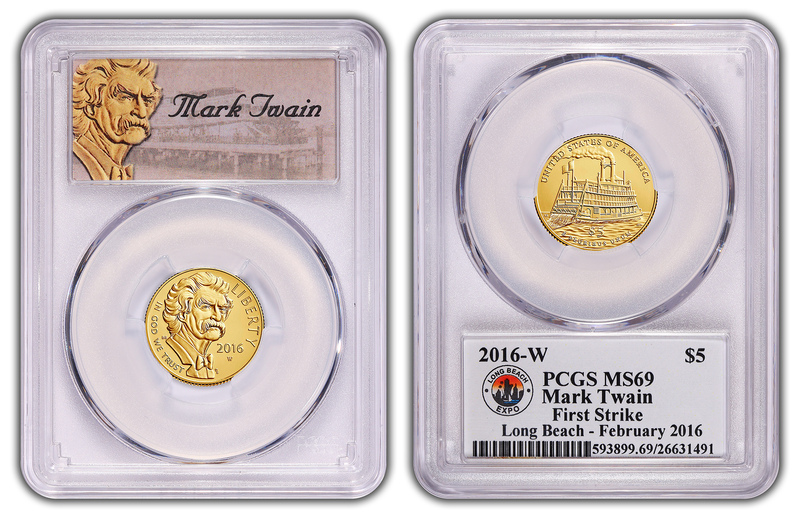 PCGS has produced special First Strike – Long Beach Expo labels for the new silver $1 and gold $5 (shown here) 2016 Mark Twain coins. An example of the PCGS 30th anniversary retro 1986-era green label insert. 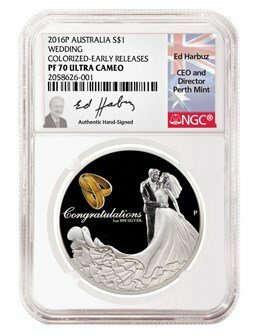 Numismatic Guarantee Corporation continues their signature labels march adding Former Perth Mint Director Ed Harbuz to the list of signatures that includes Elizabeth Jones and John Mercanti. Of course NGC as its other numismento labels. I was curious as to what my readers thought. Do you collect the labels? Do you look for the labels? Do you care? Take the survey and then weigh in with comments! Do you collect slabs with special labels from the grading services? Yes, I think they're great! Yes, but only the autographs. I collect coins, not slabs! Images of PCGS special labels courtesy of the Professional Coin Grading Service. Ed Harbuz images courtesy of Numismatic Guarantee Corporation. Exonumia are numismatic items that are items that represent money or something of value that is not considered legal tender coin or currency. When originally coined in 1960 by the founder of the Token and Medals Society (TAMS) Russell Rulau, the intent was to describe tokens, medals, and scrip. Over the course of time, other items have been added to exonumia category including some award medals and empherma like cancelled checks. Over the last few years one aspect of the industry has create a new collectible: labels. Earlier this week, Numismatic Guaranty Corporation (NGC) announced that John Mercanti, the former 12th Chief Engraver of the U.S. Mint, has agreed to individually hand sign certification labels exclusively for NGC. Mercanti will autograph labels for coins bearing his design. Last week, NGC announced that they struck a deal with Edmund C. Moy, the 38th Director of the U.S. Mint and currently the last full-time director, to autograph labels. Mercanti and Moy join Elizabeth Jones, who was the 11th Chief Engraver of the U.S. Mint, with a signature series label. Similar to Mercanti, modern coins were eligible for a Jones signature label as well as silver and gold American Eagle coins, which she supervised. Also eligible were commemoratives she designed. Since these are limited edition labels, NGC reports that the Elizabeth Jones Signature Label has sold out. 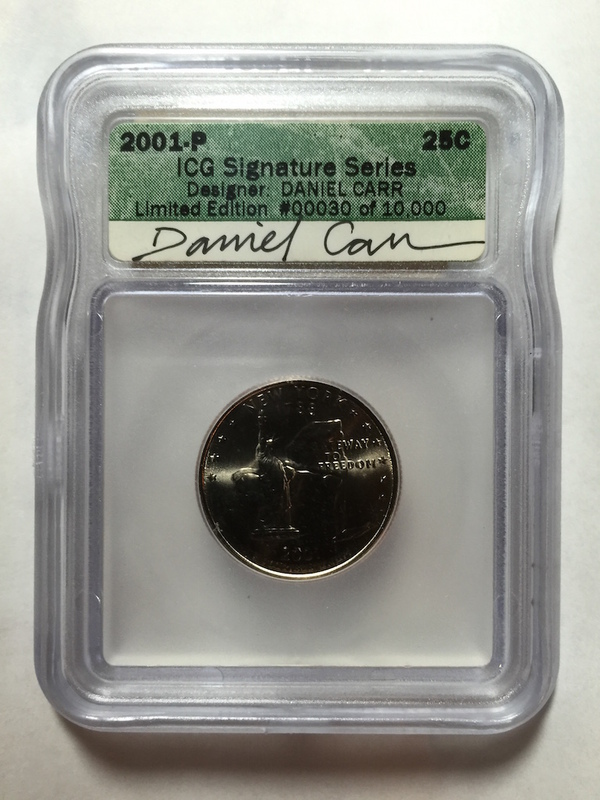 In addition to signature labels, NGC has a primary brown label and lables for First Releases, Early Releases, Detailed Grade, 100 Greatest Modern Coins, Top 50 Most Popular Coins, and many others. 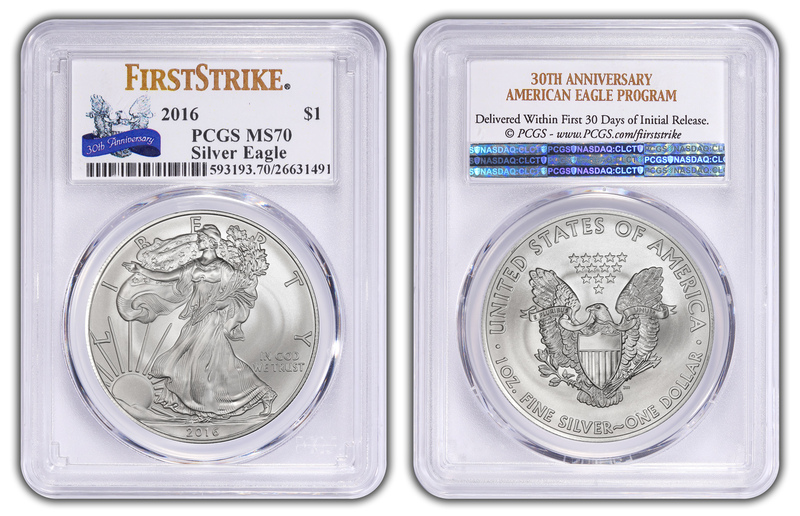 Not to be outdone, the Professional Coin Grading Service (PCGS) has its own labels for First Strike, U.S. Marshals Service commemorative and 50th Anniversary Kennedy Half Dollar. Even Independent Coin Graders (ICG) has been in the label business. Aside from their various label options, they also issued an autographed series as part of the 50 States Quarters program including the New York quarter designed by artist Daniel Carr that is part of my New York Hometown collection. Autographs are not just limited to labels. Since becoming Treasurer of the United States, Rosie Rios has been a fixture at many numismatic events autographing Federal Reserve Notes that has her printed signature. Since Rios is a prolific signer, Rosie Dollars, as she as called them, are so common that her signed notes are not worth much more than face value. Collecting numismatic-related souvenirs are not just limited to autographs, which also appear in books. Collectibles include show programs, badges, buttons, ribbons, tags, and other souvenirs related to shows, clubs, and other collecting endeavors. Autographed slabs, money, books, programs, and other items that are collected because they are numismatic-related but not real numismatic items can be fun collectibles. As an effort to me more inclusive with all aspects of collecting items related to numismatics, it needs a name. Marketing folks will tell you that a good name helps promote your product. I have an idea. We can call these collectibles numismentos. Numismento is a portmanteau of numismatic + memento. For example, let’s say you have a collection of programs from the World’s Fair of Money shows you have attended? That would be a numismento. Are you a collector of the labels from the third-party grading services or their sample slabs? You are collecting numismentos. Collecting nametags, buttons, or other items from shows? These are also numismentos! Numismentos. Numismentos are collectibles that demonstrate the culture of numismatics but are not numismatic items. NGC Signature Series Holder images courtesy of NGC. Other images are the property of the author. Fans of coins encased in plastic with special labels who also are baseball fans must be ecstatic that Fans of coins encased in plastic with special labels who also are baseball fans must be ecstatic that Numismatic Guarantee Corporation and Major League Baseball agreed to an exclusive deal that will allow NGC to reproduce team names, logos, and stadiums on labels used in NGC slabs. NGC announced that they will “encapsulate the National Baseball Hall of Fame commemoratives and other legal tender coins with attractive certification labels that feature a range of popular MLB trademarks.” Aside from the Major League Baseball logo, the logos of the 30 clubs, and stadium images, it will also include logos of All-Star Game and those used for post season. NGC says this is gives their customers “an exciting new opportunity to combine their passions for the sport and the hobby.” What it gives is NGC a new area for marketing and to extract money from the market. I understand that NGC is a business and has owners that are concerned about the business generating revenues. But what this will do is increase their revenues at the risk of some of the protections they claim is good for the hobby by encouraging cracking slabs, thus making the population reports even less reliable than they are today. Unlike the fans of plastic, I really consider the coin encased in the slab. It is possible that I may like a coin even with the consequence that the label inside that slab has a decoration I am allergic to. If I decide that the coin is worth purchasing even if I ignore the label, I will buy the coin, but that label will have to go. There is no question that when I bring the coin home, the slab will be cracked, the coin removed, and the label finding its way to an appropriate disposal fitting of my opinion of that team. Once cracked out of the slab, I could send it back to NGC and just have them re-grade the coin an put it in a plain slab. I could send it to Professional Coin Grading Service to see if they will give me a more solid grade. If it is a Morgan dollar I can ask ANACS to attribute the VAM. I could also ust keep it as a raw coin. Since the vast majority of my collection is not slabbed, this is not a problem. Besides, I know it is genuine because NGC slabbed it and I could submit it later if I need it slabbed again for resale. Frankly, how many people actually save the labels and report their crack outs to the grading services? In the few cases when I have cracked coins out of its plastic tomb, I have not reported the cracked out coin to NGC. They have been cracked out of the slabs from multiple companies and submitted to NGC at a time I was working on a registry set. I believe this will encourage cracking out of the slab and make the population reports less reliable than they are today. Not only will this affect the grading service population reports but it could affect coins with Certified Acceptance Corporation stickers. My hatred of the Yankees will not have me think twice about cracking that plastic just because the CAC or anyone else put a sticker on the slab. If I am not telling NGC I obliterated their label, I am not reporting it to CAC either—especially since I am not exactly a fan of CAC. I do not begrudge NGC for doing what they need to do to earn a living. But they need to explain how these gimmicks align with their uncompromising standards and a commitment to integrity. Just admit that these gimmicks are being used to improve revenues and that everything else is window dressing. I would respect the honesty. This 1878 eight tail feathers Morgan dollar, graded PCGS PO-1 (none worse! ), is from the End of the Trail VIII Collection of Low Ball Morgan dollars that will be exhibited for the first time during the 2014 ANA World’s Fair of Money. There was an interesting buzz around the numismatic world when it was announced that Professional Coin Grading Service was going to display the “End of the Trail” Morgan dollars registry, the lowest graded basic set of Morgan Dollars. The End of the Trail registry set is the finest set in the PCGS Registry of “Low Ball” coins. In 2009, PCGS began to offer rewards for what they called and “everyman” or second tier registry competition. Apparently, it became a race to the bottom. While people are looking for the best coins their money can buy, someone went quite the opposite and set out to find the worst of the worst. “It is the all-time finest, or in this case, the worst-of-the-worst basic Morgan dollar set in the Low Ball category. While collectors have a lot of fun with the Low Ball sets, remember that it often is just as difficult and exciting to build a low grade set as it is to assemble a high grade collection,” said PCGS President Don Willis. Who am I to argue. After all, someone put together a set of PO-1 and FR-2 coins, many marked “None Worse,” and probably cost more to have them graded than the coins cost to purchase. Then who is to say that some did not find their way into a pocket or two before being submitted? Cynicism aside, there is something ironic about putting together a set like this and it has to do with just having fun. It had to be a lot of fun to go around and search through junk boxes or ask dealers for their worst coins. It must have been interesting seeing the face of some of the dealers when they hand over their worst Morgan dollars only to be told they were not bad enough. Think about it for a moment. Dealers are looking for the best, most pristine inventory to sell to eager buyers who walk by their cases looking at the pretty and shiny coins. When coins are not good enough to make the inventory, they are thrown into junk boxes for people to pick through. Larger coins, like Morgan dollars, would be sold for a price around their melt value since there would not be much of a numismatic premium. The adventure had to be a lot of fun for the person assembling the set. That what this is all about, having fun! If you are stressing out about the worth of your set, are you really having fun? Are you having fun worrying about the plastic entombing the coin or whether someone placed a sticker on that plastic or is the coin the most important part of your collection? I know the registry sets exist for the third-party grading services to promote their products and get people to submit coins. I know putting together a top set can be gratifying. But is it fun? Are you putting together that set for the fun or the profit? There are a lot of people who collect coins in some form. Some collect high grade Morgan dollars while others collect varieties or VAMs. Some pursue the best and most rare coins while you find many digging through junk boxes at the shows looking for that one small gem to fill the hole in their collection. You may like high-grade Buffalo nickels while others are searching half-dollar rolls they pick up at their local bank. Regardless of how you collect, what you collect, and where you find your collection, if you are not having fun then maybe you should rethink what you are doing. This 1794 Liberty Cap Head Right Large Cent has been around since the time of George Washington and looks the part. This coin has been cleaned making it a candidate for a no-grade if I should submit it to a grading service. A very worn flat 1798 Draped Bust Large Cent. It took a lot of light and a 16x loupe to determine the date! Another worn flat Draped Bust Large Cent. This one is from 1803 and just has a lot of character. Now if you would excuse me, there are some tokens and medals from my hometown of New York I bought at the Whitman show I need to add to my collection. Morgan dollar image courtesy of PCGS. Now that it is award season, Professional Coin Grading Service is getting into the act by release its first annual listing of the “PCGS Top 100 Modern United States Coins.” PCGS is using the rising popularity of modern coins, those minted since the change to base metals in 1965, to bring this list to the public. 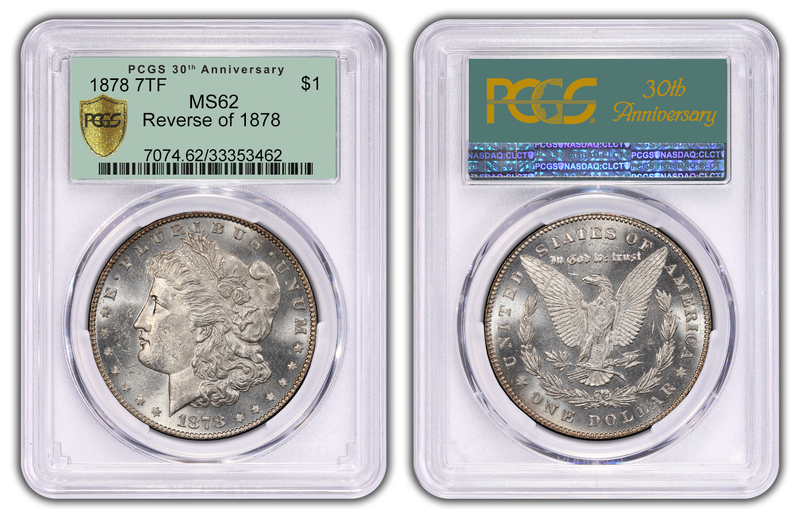 PCGS announced the list on January 11, 2013, during a luncheon at the Florida United Numismatics Convention in Orlando, Florida. PCGS is offering a $10,000 reward to verify a genuine 1964-D Peace dollar, the number one coin on the new PCGS Top 100 Modern U.S. Coins list. This image is a PCGS artist’s conception of a 1964-D Peace dollar. Topping the list is the 1964-D Peace dollar, a coin that was struck but never put into circulation and allegedly destroyed. In 1964 the price of silver rose to new heights that it made the value of ordinary circulating coins worth more for their metals than their face value. Because of this, silver coins were being hoarded by the public and becoming scarce in circulation. Western states that relied on hard currency including the gaming areas of Nevada needed the U.S. Mint to strike additional coins for circulation. The striking of a dollar coin had a powerful ally: Senator Majority Leader Mike Mansfield, Democrat from Montana, whose state would be directly affected by the new coins. Although the numismatic press was not in favor of the measure because of its limited ability to solve the coin shortage, Mansfield pushed a bill through congress to authorize the Mint to strike 45 million silver dollars. After much discussion, the Mint looked for working dies but found that few survived a 1937 destruction order. Those that did survive were in poor condition. Mint Assistant Engraver Frank Gasparro, who would later become the Mint’s 10th Chief Engraver, was authorized to create new dies of the Peace dollar with the “D” mintmark. Since the coins would mostly circulate in the west it was logical to strike them closest to the area of interest. Treasury Secretary C. Douglas Dillon was opposed to the the coin and wrote a letter to President Lyndon B. Johnson saying that the coins would not be likely to circulate and be hoarded. After Dillon resigned, Mansfield questioned the new Secretary, Henry H. Fowler, who assured Mansfield that the coins would be struck. 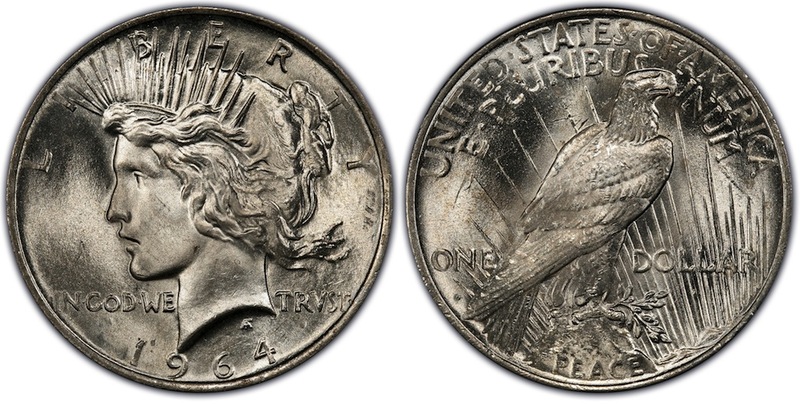 Although Mint Director Eva Adams, who was from Nevada, also objected to striking the coin, the Denver Mint began trial strikes of the Peace dollar on May 12, 1965. When the coins were announced three days later, coin dealers immediately offered $7.50 per coin which would ensure that they would not circulate as intended. Everyone saw this as a poor use of Mint resources during a time of sever coin shortages. Adams announced that the pieces were trial strikes never intended for circulation and were later melted under reportedly heavy security. To prevent this from happening again, Congress added a provision in the Coinage Act of 1965 (Public Law No. 89-81; 79 Stat. 254) that put a moratorium on striking silver dollars for five years. There have been reports that some Peace dollars were struck using base metals (copper-nickel clad) as experimental pieces in 1970 in anticipation of the approval of the Eisenhower dollar. The same reports also presume these coins have been destroyed. For collectors of silver crown-sized coins and large U.S. dollars, the 1964-D Peace dollar is the ultimate fantasy coin. As someone who collects silver coins including modern bullion issues, it should come as no surprise that I chose the 1964-D Peace dollar for this blog’s logo. My version was made using Photoshop and colored to not look “real” to avoid potential issues from our law enforcement friends at the Department of the Treasury. It would be difficult to put a price if a version of the coin is found. It would certainly be a unique coin whose auction would start well out of my price range—maybe set a record for being the highest price paid for a single coin, topping the 1933 Farouk-Fenton Saint-Gaudens Double Eagle that sold for $7,590,020 in 2002. 1964-D Peace Dollar: The most controversial and one of the most famous of all modern issues. 1975 proof no “S” mintmark Roosevelt dime: Only two known, and one recently sold at auction for $350,000. 1974 aluminum Lincoln cent: 1,570,000 were minted but only one is known and is graded PCGS MS62. 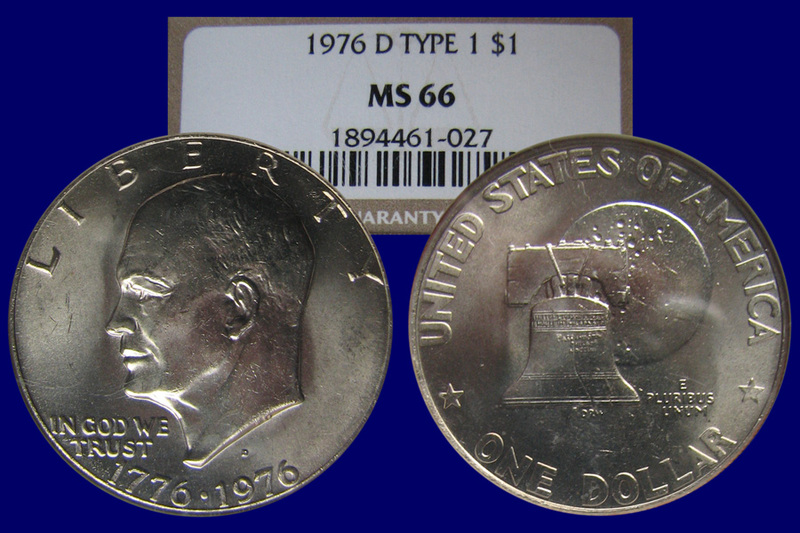 1976 proof no “S” mintmark Bicentennial Type 2 Eisenhower dollar: only one example is known. 1964-D Peace dollar image courtesy of PCGS.